If you happen to raise ground cherries, you may end up finding yourself swamped with an excess of the little fruits. 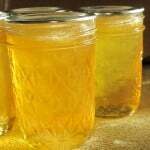 lemon ground cherry jam will help you use up a LOT of ground cherries in a hurry. The lemon cuts the sweetness of the ground cherries, and my family prefers a jelly over a jam for ground cherries because their large number of seeds makes a jam almost gritty. 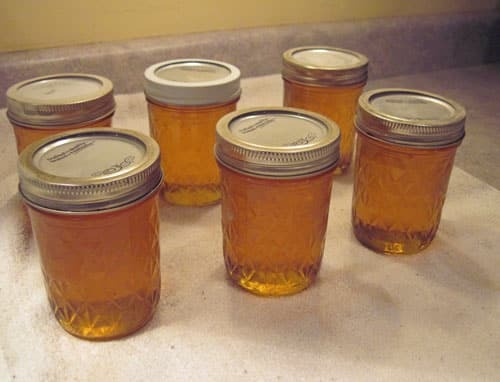 I created this recipe when I was still using standard pectin, so there is quite a bit of sugar. You can cut the sugar in half if you use Pomona's Pectin or other low sugar pectin products. When using Pomona's Pectin, add 4 teaspoons calcium water and 4 teaspoons pectin powder and process according to package insert directions. Reduce to 3 teaspoons each for a softer jelly. 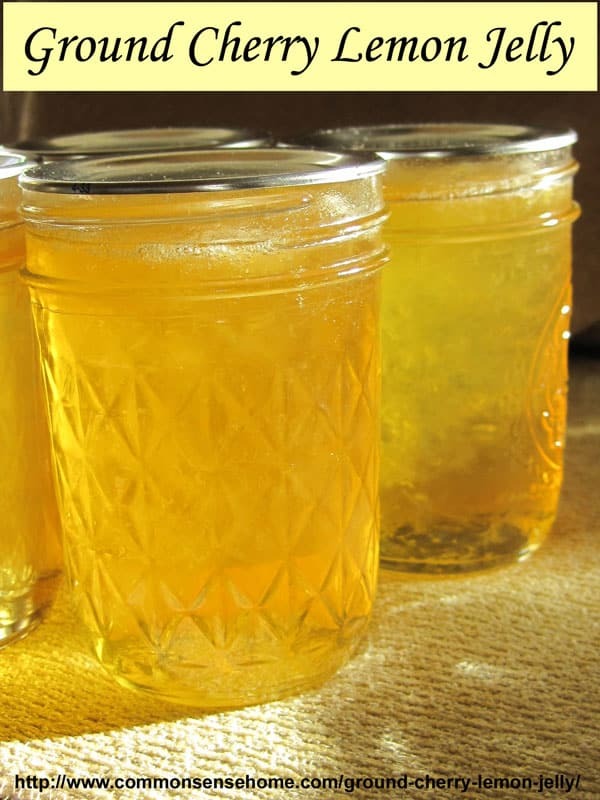 This jelly tastes like the best old-fashioned lemon drop you ever had. Serve it on toast with a bit of honey or almond butter and you've got a little slice of lemony heaven. To prepare ground cherry juice, husk and wash ground cherries, run them through a food processor. I used around two 11″x 22″ cardboard strawberry picking flats full of ground cherries to get 3 1/2 cups of juice. Cook gently for at least 15 minutes, until very soft. Drain through jelly bag for several hours or overnight. Avoid squeezing bag to keep juice clear. Grate one tablespoon of zest from 1-2 lemon(s). I use a Microplane zester. Juice the lemon(s) to obtain ½ cup juice (you either need a large lemon or lemons or can substitute a little bottled juice to make up the difference). Sterilize seven 8-ounce jars, keep hot. Prep rings and lids. Fill water bath canner and bring to boil. Measure sugar and set aside. Combine juices and zest, stir in pectin and butter. Bring to full rolling boil over high heat, stirring constantly. Immediately add all of the sugar. Bring back to full rolling boil and boil 3 minutes, stirring constantly. Ladle jam into sterilized jars leaving 1/4″ headspace. Wipe rims clean and screw on the lids. Process for 10 minutes in water bath canner (add 1 minute for every 1,000 feet above sea level). Makes around 7 half pint jars. This time around I ended up with 6 1/2 jars (the half went into the fridge). Homemade Jams and Jellies Make Great Gifts! These make beautiful and unique Christmas gifts. (You know no one has ever gotten lemon ground cherry jelly before). Ground cherries can produce a lot of fruit in a small area, so four to six plants should be plenty for a batch or two of jelly and fresh eating. I'm sure you could substitute Cape Gooseberries instead of ground cherries, if you have them. You may also substitute very ripe tomatillos for the ground cherries. You may also enjoy a full listing of our jam and jelly recipes. 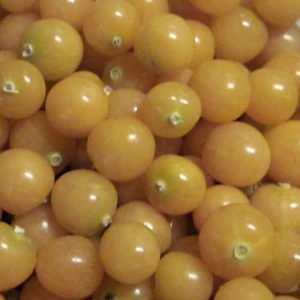 Prepare ground cherry juice by husking and washing ground cherries, then running them through a food processor. Cook ground cherries gently for at least 15 minutes, until very soft. Drain through jelly bag for several hours or overnight. Avoid squeezing bag to keep juice clear. Grate one tablespoon of zest from 1-2 lemon(s). 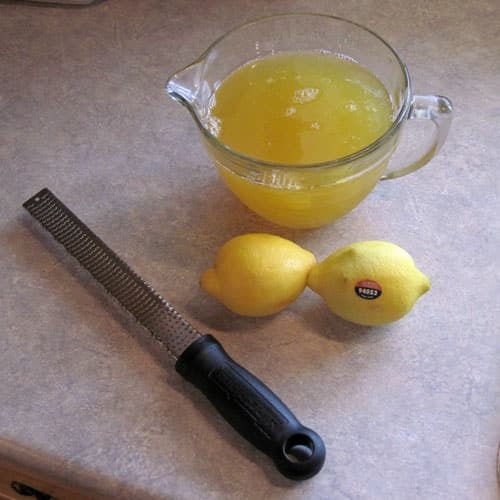 Juice the lemon(s) to obtain ½ cup juice (you either need a large lemon or lemons or can substitute a little bottled juice to make up the difference). Ladle jam into sterilized jars leaving 1/4″ headspace. Wipe rims clean and screw on the lids. Process for 10 minutes in water bath canner (add 1 minute for every 1,000 feet above sea level). Makes around 7 half pint jars. 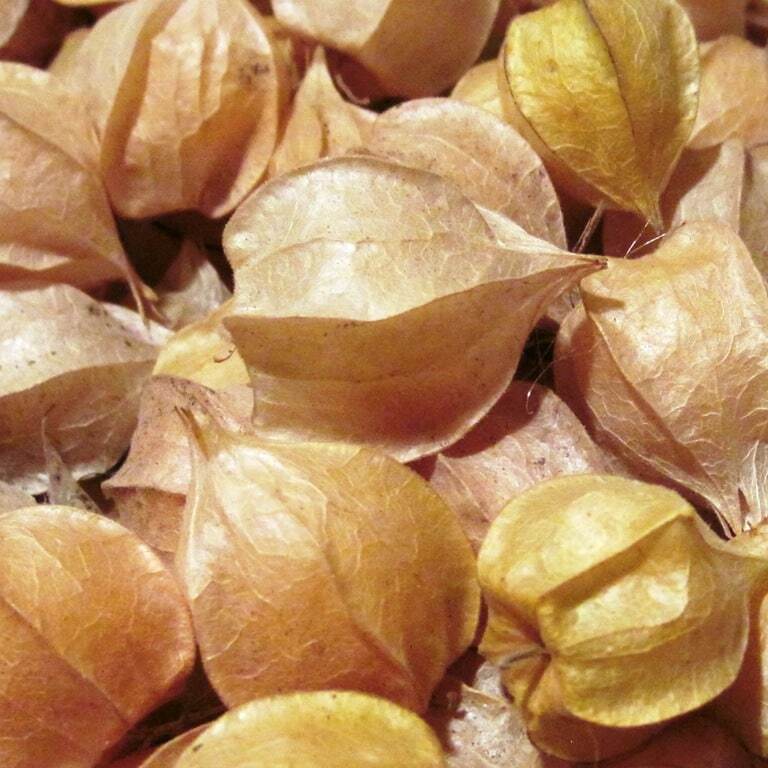 Those look like physalis, do you call them ground cherries on purpose? I have also grown Physalis peruviana – Cape Gooseberry, but they don't mature early enough in our area to get much of a harvest before frost. Physalis pubescens- found growing wild from NY to Florida and west to Minnesota and Iowa southward to the tropics. Physalis peruviana (aka Cape Gooseberry and called Poha in Hawaii)- originally from Peru. These are not commonly seen in the U.S. except in Pennsylvania Dutch country and parts of the Midwest, and Hawaii. Can I grow these in one season in Missouri? You're from WI, so it gets cold there too. An annual? Yes, these are an annual. I couldn't see any reason why they wouldn't grow in Missouri. I’ve been Googling recipes for ground cherries, including making jams/jellies & desserts. This recipe sounds really good, but I prefer to leave the seeds in, and am wondering if this can be made without worrying about removing the skins and the seeds, as we like chunky fruit in our jams and jellies. I’d like to try this as soon as our ground cherries are ripe…which will be soon! We’ve had 3 ripe ones to indulge on so far…LOL! I’m sure it would work as a jam instead of a jelly, no problem. It’s a strange thing – my guys don’t mind strawberry chunks but they don’t like ground cherry chunks. Thanks for this recipe! I grew ground cherries for the first time this year and I’m ready to make some jelly. I personally like seed-y jam, but I’m finding that the cherries are SO seedy that I think it might be excessive. (Plus the rest of my family isn’t a fan of seed-y jam). I’m quite new to canning and I was wondering if you could elaborate a bit more on how you made the juice. 🙂 I have a food mill (which I’ve never used before!) but no jelly bag. Because the seeds are so tiny, they will sneak through most food mills or food strainers. Thus, the use of a jelly bag. If you don’t have a jelly bag, you can substitute an old pillow case or a flour sack towel. Just scoop the cooked pulp into the towel, hang over a bowl and let drain. You can see an example in the currant jelly post where I’m using a jelly strainer and an old t-shirt. Be careful if you have flimsy cabinets, as a heavy jelly bag hanging from a cabinet door may cause them to sag over time. My mom sometimes hung bags to drip from the backs of chairs and set the bowl on the floor, but this can be a problem with pets or small children. Thanks for solving a little mystery for me! When I was growing up my Mom would occasionally pick up a jar of Poha preserves. She is not much of a sweet eater, but she did savor the tart, sweet, fruity textured jam. I’ve grown gooseberries in the Midwest and was puzzled about why the just don’t look or taste the same. I’d love to surprise Mom with a jar or two, but guess this will have to wait until our greenhouse is up and we experiment on how to bring in a crop. I’ve never had fresh Poha. They are said to be sweeter than those little ground cherries, in addition to being bigger. Must be the steamy jungle sun. Would love to know how your greenhouse works on this one!